All the news that's fit to fetch! But while your dog is at daycare, it’s important to note that it is also beneficial for them to get some midday rest rather than engaging in non-stop play. I know what you’re thinking: you don’t want Fido to get too much rest during the day because then they’ll be wound up when they get home! But let’s look at the facts. Studies have shown that incorporating rest periods and naps into training actually help the dog retain more of what they learn. 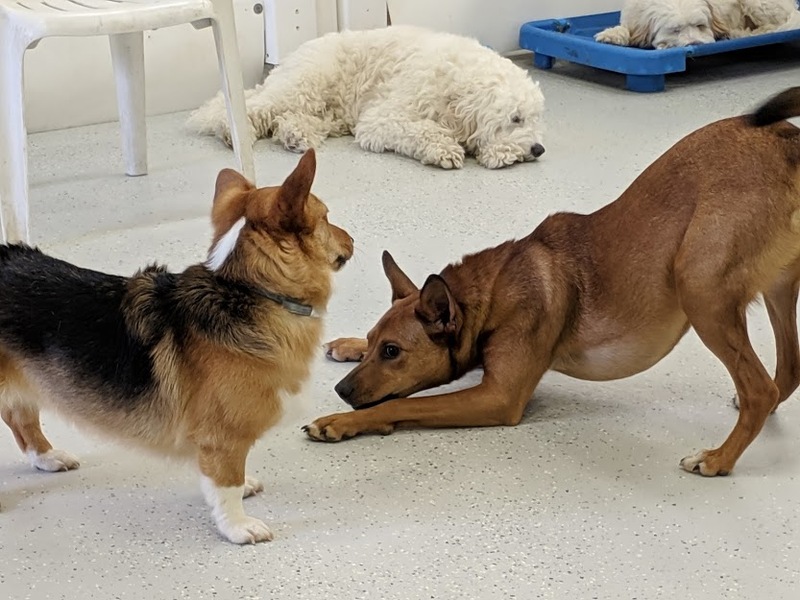 Although it’s not a formal training session, your dog is constantly learning new things while at daycare. Dog-to-dog interactions are part of the social skills that dogs are constantly learning and can change from day to day. Also mixed into play are interactions with the staff: skills like Recall, waiting politely at doors, and not jumping up on people are consistently being reinforced throughout the day. Allowing your dog to take periodic rests throughout the day is crucial to their ability to absorb all of this information. Midday rest periods also helps them recharge to continue learning and better enjoy their time in the afternoon as a Full Day attendee. Many puppies find a Half Day of daycare is sufficiently taxing. Many Full Day attendees will be given several breaks throughout their day to recoup as an alternative. The exact amount of necessary rest depends on the dog. Puppies and adolescent dogs (as well as other easily over-aroused dogs) need more frequent breaks and often won’t take breaks on their own in a group setting. Some adult dogs, on the other hand, are very good at self-regulating and can take breaks willingly by choosing a comfy spot in the playroom to nap. Much like us, dogs need balance throughout the day. A popular belief in dealing with a high-energy dog is to just keep running them until they are so tired that they pass out for a few hours. But forcing too much exercise and stimulus on a high-energy dog can actually make them even more high-strung and energetic! Although dogs do need to run and blow off steam, there should be a balance with calm, restful periods in between to help them mentally refocus and could prevent accidental injury due to over-exertion. Some dogs are comfortable taking breaks while play continues around them. More often, puppies and easily aroused dogs need a break in our Slumber Room, away from all the commotion. 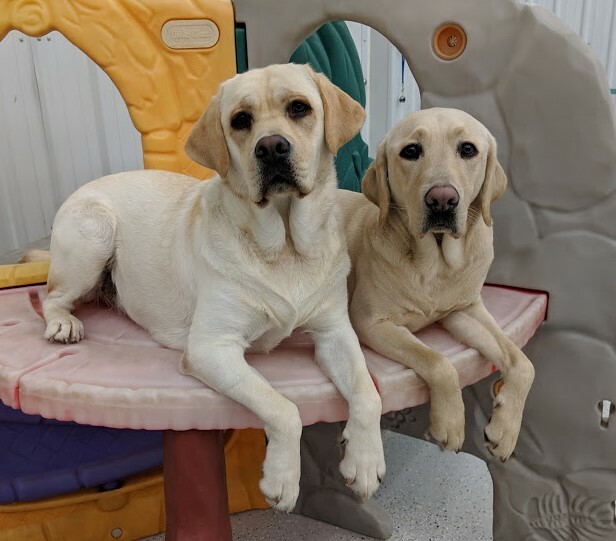 Although cots are available to lay on in the daycare play space, not all dogs will allow others to take a much-needed rest! It’s important to note that there are different types of stress. There is both good stress and bad stress; the excitement and arousal of a game of fetch and the nervousness of a vet visit both elicit similar physical reactions in the dog’s body. Ultimately it is their emotional reaction to the situation that dictates if the stress is “positive” or “negative”. The problem arises when a dog continues to be highly aroused and excited for a prolonged period of time. This positive stress (called “eustress”) triggers hormones to flood the bloodstream. If the dog continues to be highly aroused, the body continues to pump out hormones that are unable to dissipate - further adding to their arousal level. This creates a feedback cycle of the dog being highly aroused, leading people to think they need more exercise, which causes more stress and hormones to be released, which then leads to an unruly dog seemingly in need of even more exercise! Even when the stress is positive, like with play and fun exercise, the body isn’t meant to maintain a high level of stress for long periods of time. By prolonging the stress, a dog’s body chemistry can actually change and this state of high arousal and hyperactivity becomes the dog’s normal state. So how do you make sure your dog is tired but not negatively affected by too much excitement? A combination of play, rest periods, and mental (non-physical) activities is the key. Getting a dog’s brain working for a short time can be just as exhausting as a long period of exercise! Mixing up periods of play, rest breaks, and brain games - like practicing obedience skills, elective activities, and food puzzles - throughout the day will help your dog maximize their learning skill and minimize their stress (both good and bad). Sometimes everyone will take a short break at the same time together! Often the older and less social dogs will rest while everyone continues to play. Most dogs prefer a private space to enjoy a special frozen treat or undisturbed nap. It's All In a (Dog) Day's Work! So you’ve dropped your dog off for daycare: now what? We've Got a Bone to Pick with Dog Bones! A dog and his bone; but is it safe?